Figure 1. Structure of mature fruits and seeds of Beta vulgaris (sugar beet). (A-H) Visible events during the incubation of sugar beet fruits in water: (A) Dry fruit. (B,E) Operculum opening; note that the radicle tip is still enclosed by the micropylar endosperm and the inner testa. (C,D,F-H) Radicle emergence through the seed covering layers (testa and endosperm) is the completion of germination. (I,J) Seed germination studied with deoperculated fruits. The sugar beet seed has a lentil-like structure (about 3 mm diameter and 1.5 mm thick) and occupies a horizontal position within the fruit. 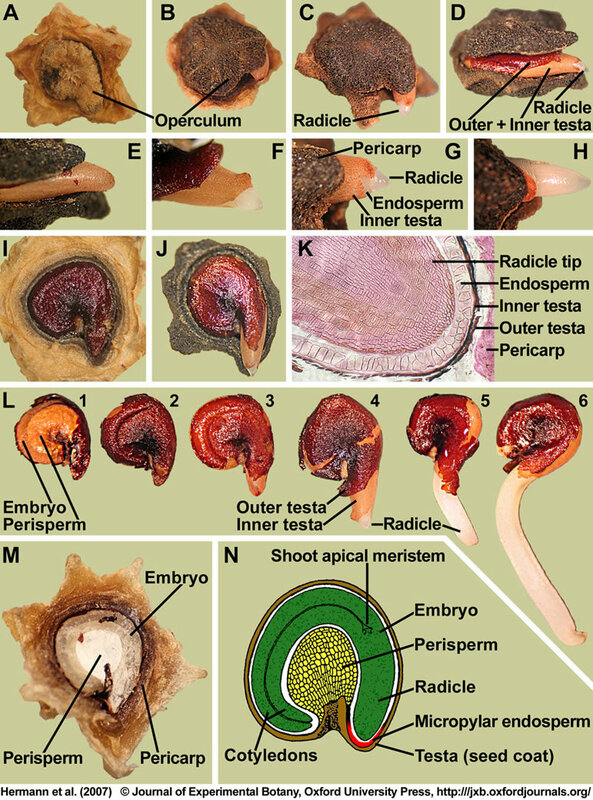 (J) Radicle emergence through the seed covering layers (testa and endosperm) is the completion of germination. (K) Microscopic section through a dry fruit showing the radicle tip enclosed by the covering layers. (L) Distinct stages of sugar beet seed germination: Isolated dry seed (1,2); note that the testa was removed in (1) to make the embryo and perisperm visible. Imbibed seed showing rupture of the outer testa (3) and radicle protrusion through all the seed covering layers (4-6). (M) Section through a mature sugar beet fruit. The curved embryo completely encloses the perisperm, which is dead starch storage tissue localized in the seed center. (N) Drawing of a sugar beet seed; modified from Bennett and Esau (1936). Based on the peripheral location of the embryo, the sugar beet seed can be structurally classified as being perispermic and P-type (Finch-Savage and Leubner-Metzger, 2006).